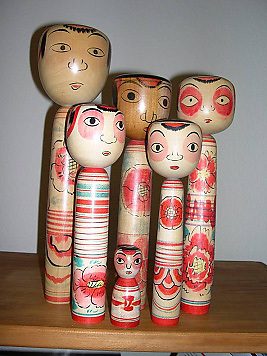 Nakanosawa dolls are very distinctive dolls due to their atypical Japanese eyes surrounded by large, pink rims. This doll was made in tribute to a street entertainer who walked on his hands with a pillow between his knees and had make up similar to the faces of these dolls. After his death, people wanted a doll in his memory, so this doll was “born”.